Many companies, especially non-profits, use address labels as a thank you to donors, good clients, etc. Buying pre-printed address labels can become expensive and you’ll be stuck with whatever design you chose until you run out. By printing your own address labels, you can change the design at any time and only print out however many you need at that time; no matter how big or how small of a print job. 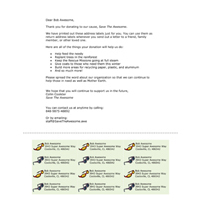 In this example we’ll be using the made up non-profit called “Save The Awesome.” This address label sheet will be going to one of their donors, Bob Awesome. In the interest of time, money, and paper, the Save The Awesome staff wants to print out some address labels and a letter on the same sheet of paper. They opted to use the LS-ADDRESS because the label sheet layout gave them enough room to include a small letter right above their labels. Also, they’ll be using the blank template for the layout in Microsoft Word. Let’s take a look at how they went about completing their label sheet layout. Download the Microsoft Word template for the LS-ADDRESS label either from the LS-ADDRESS product page or the template page. Open the template in Microsoft Word. Remove the logo and the arrows as you see fit. Now you get to design your address label sheet! We recommend leaving the address label borders set to black (or another visible color) until you’re done designing them. 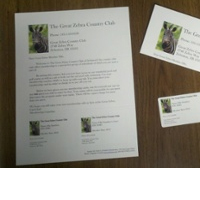 Once you’re done designing you can remove the borders (same goes for the perforation line). Step 4: Print Your Address Labels! Now it’s time to print your label sheet! 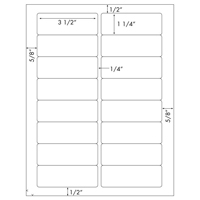 Before you print on your actual label sheets, it’s recommended that you print on a regular piece of paper then compare the printed piece of paper with the address label sheet. 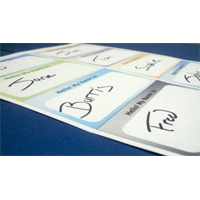 It’s possible that something was accidentally moved during the designing of the labels and you want to make sure you have them as close to the label sheet as possible before printing on your actual label sheet. Not endorsed by or affiliated with: Microsoft Word is a registered trademark of Microsoft.